Raynaud’s Phenomenon | APS Foundation of America, Inc.
Raynaud’s phenomenon is a condition that affects your blood vessels. If you have Raynaud’s phenomenon, you have periods of time called “attacks” when your body does not send enough blood to the hands and feet. There are two types of Raynaud’s phenomenon. Primary Raynaud’s phenomenon occurs for an unknown reason. It is the more common form of Reynaud’s phenomenon. Secondary Raynaud’s phenomenon is caused by another health condition. Secondary Raynaud’s phenomenon is less common but more serious than the primary form of the disease. Attacks usually happen when you are cold or feeling stressed. During an attack, your fingers and toes may feel very cold or numb. 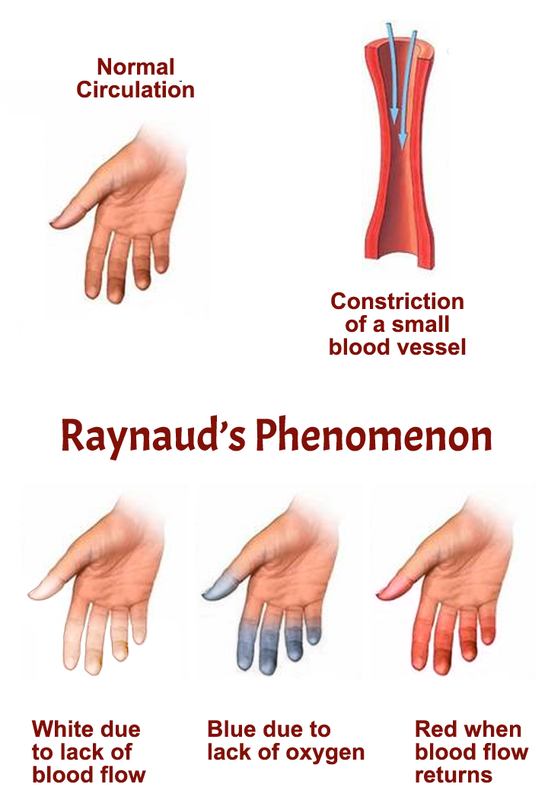 Raynaud’s phenomenon is also called Raynaud’s disease or Raynaud’s syndrome. Anyone can get Raynaud’s phenomenon but some people are more likely to have it than others. People living in cold places. Lupus, which causes the immune system to attack healthy tissues in the body. Scleroderma, which causes the skin and other tissues in the body to harden. Sjögren’s syndrome, which causes dryness in the mouth and eyes. Some research suggests that Raynaud’s phenomenon runs in certain families, but more research is needed. During an attack, your body limits blood flow to the hands and feet. This makes your fingers and toes feel cold and numb. It may also cause your fingers to turn white or blue. Once blood flow to the fingers and toes returns, they may turn red, tingle and begin to hurt. An attack usually lasts a few minutes. In some people, it may last more than an hour. The symptoms of the primary form of Raynaud’s phenomenon usually begin between the ages of 15 and 25. The symptoms of the secondary form of Raynaud’s phenomenon usually start after the ages of 35 to 40. For many people, especially those with a primary form of Raynaud’s phenomenon, the symptoms are mild and not very troublesome. Others have more severe symptoms. Doctors do not know exactly what causes Raynaud’s phenomenon to develop, but they do know what causes some attacks. Usually when a person is exposed to cold, the body tries to slow the loss of heat and maintain its temperature. To do so, blood vessels in the surface of the skin move blood from veins near the skin’s surface to veins deeper in the body. In people with Raynaud’s phenomenon, blood vessels in the hands and feet appear to overreact to cold temperatures or stress. They narrow and limit blood supply. There is no single test to diagnose Raynaud’s phenomenon. Looking at fingernail tissue with a microscope. If you are diagnosed with Raynaud’s phenomenon, your doctor will likely perform more tests to determine what form of the disease you have. Reduce how many attacks you have. Prevent loss of finger and toe tissue. Medicines that relax blood vessels. Pregnant woman should not take these medicines. If you have a severe case of Raynaud’s phenomenon, you may need surgery to restore blood flow to parts of the body affected by the disease. Keep warm. Set your thermostat to a higher temperature. You lose a lot of body hear through your head; wear a hat. Keep your feet warm and dry. In cold weather, wear several layers of loose clothing, socks, hats, and gloves or mittens. Keep pocket warmers in your pockets if you are will be outside for a long time. Use insulated drinking glasses when drinking something cold. Put on gloves before handling frozen or refrigerated foods. Avoid rapidly shifting temperatures and damp climates. Rapidly moving from 90 degrees outside to a 70-degree air-conditioned room can bring on an attack. So can damp rainy weather. Avoid air conditioning. In warm weather, air conditioning also can bring on attacks. Do not smoke. The nicotine in cigarettes causes the skin temperature to drop, which may lead to an attack. Avoid medicines that bring on attacks. Certain medicines cause the blood vessel to narrow, which can bring on an attack. These include beta-blockers, cold preparations, caffeine, narcotics, some migraine headache medications, and some chemotherapy drugs. Talk to your doctor before starting any new medicines. Do not stop any medicines you are taking without talking to your doctor first. Control stress. Because stress can bring on an attack, learning how to manage or control stress is important. Talk to your doctor about stress reduction techniques. Exercise regularly. Exercise can improve your overall well-being. In addition, it can increase your energy level, help control your weight, keep your heart healthy, and improve sleep. Talk to your doctor before starting an exercise program. NIAMS Clearinghouse information specialists are trained to assist callers and provide other sources of information; however, they are not healthcare professionals. The information they provide cannot substitute for the medical expertise and advice that resides with your primary healthcare provider. Information specialists do not provide medical advice or referrals. The NIAMS encourages you to consult your primary healthcare provider to discuss information you find on our site. The NIAMS does not endorse or recommend any commercial products, processes, or services. Brand names may be included in documents on this site. These are provided as examples only, and their inclusion does not mean that the NIAMS, the NIH or any other government agency endorses them. Also, if a particular brand name is not mentioned, this does not mean or imply that the product is unsatisfactory.